If you see an error message about a bad file when you try to listen to an audiobook, some of its parts may not have downloaded correctly. Bad Audiobook Part: This audiobook part cannot be played because of a bad file. Delete and re-download this part from the Files menu. Note: We always recommend using the most up-to-date version of the app. 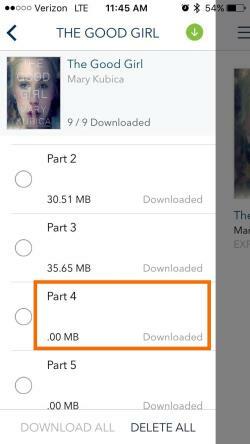 To resolve this issue, delete and re-download the problematic audiobook parts using the steps below. Tap Files and select the audiobook that's causing the error. Tap and delete any parts that say "Downloaded" and "0 MB". Tap and re-download the deleted parts. Once all the parts are downloaded, go back to the bookshelf and try listening to the audiobook again.